Today I am presenting you an awesome Veg Dum Biryani recipe that looks and tastes like in Restaurant Style. This is a simple, delicious, flavorful Rice Dish that comes from my kitchen is very popular in my family, friends and colleagues. If you want to impress your hubby or guests in no time with little effort this is the rice dish that you should try. I have learnt the secrets to make it look like in Restaurant Style from one of my good friend who is a Chef in Restaurants, here I am breaking the secret spell to you, Lucky You! Here is the recipe, Njoy! Wash Basmati Rice thoroughly for 2 times and drain in colander and set aside. Chop Onions and Green Chili in long and thin slices. Peel the potato and carrot, cut them into cubes. Chop Green Beans into medium size pieces. Take a non stick kadai add 1 Tbsp Oil, followed by 1 Tbsp Butter. Once butter melts, add spices in the order, Cardamom, Clove, Cinnamon, Nutmeg, Star Anice, Shawzeera ( break cardamom and nutmeg in mortar before adding to kadai). As the spices are sauted ( for 1 min), add half of onion slices and green chili slices to Kadai and saute for 3 min. Now add Ginger Garlic Paste and mix it well with onions. Add 1 tsp salt and black pepper to onion mix. Add Basmati Rice to Kadi and mix it with spices and onion mix. Saute for 2 min. Take Non-stick Rice cooker and add 5 cups of water to it. Switch off the stove and transfer the Rice mixture to Rice Cooker. Keep the Rice Cooker On and cook it until Rice is done. When the Rice is about to done, mix the food color in 1 tbsp water and pour it on top to the rice in the rice cooker. ( just use only 2 colors, I have used Orange and Yellow). Meanwhile, take the same Kadai, keep it on the stove and add 2 tbsp oil. add remaining onion slices to the kadai and cook for 2 min. Add Potato, carrot cubes and cook for 2 min. As the potatoes are softening, add Green Beans, Cauliflower Florets and cook for 3 min. You will notice the veggies becoming soft, finally add Green Peas and Broccoli Florets. Add 1 tsp salt and garam masala to vegige mixture. Don't cook them very soft. They should be cooked to medium soft, so that they should retain their shape and color. Swtich off the stove and take off the kadai from the stove and set it aside. Rice also should be cooked by now in the rice cooker, switch off the rice cooker (when the setting comes to warm) and fluff it up with fork so that colors spread evenly. Take a Aluminium Tray and sprikle with Pam or add 1 tsp of Ghee and spread it evenly ( this avoids the bottom rice from burning or overcooked in the oven). Divide Veggie Mixture into 2 parts and Rice into 3 parts. Now add 1 layer of rice and add 1 layer of veggie mixture on top. Add some cilantro on top sprinkle lime juice. Add another layer of Rice and remaining Veggie mixture, add remaining cilantro and lime juice, and add final layer with remaining rice on top. cover with aluminium foil and set the Oven temperature to 200 F ( or 100 C), keep the covered aluminum tray in the oven and cook for 15 to 20 min. This will let the rice slow cooked to allowing to spread the veggie and spicy flavors to rice. After 20 min, take the tray out of the oven and serve from one side ( do not mix it up, that will mash the vegetables) While serving go into deep in the tray to get all the layers of rice and veggies. The colors are spread very nicely, and veggie flavors sink into rice and rice will be aormatic, beautiful and delicious. Serve with some Aloo Kurma or Onion Raita. I am nto a favorite of food colors, but some times I use them sparingly in some selective dishes. If you don't like food colors, you can totally skip them, it doesn't affect taste at all. When you are cooking veggie mix, don't cook them too soft, the indication is they should always retain their shape and color. If they are loosing their shape means, you have cooked them too much. This is the trick to get Restaurant Style. Potatoes and Carrots should be always cube shape not in round shape, Green Beans and Peas should retain their color. And also, if you have patience, you can remove all the spices ( Star Anice, Cinnamon, Colves etc) from the Cooked Rice before you start layering. I didn't do it as you know I don't have that much patience. If you notice you don't see these spices in the rice dishes from Restaurant. Because they will take them away so that't they don't come in between when you eat. Add oil to the aluminum tray, other wise you will bottom layer of the rice can get burnt or roast ( as depends on the oven temperatures and settings). I have burnt once, since then I always follow this trick and it helped me not burn the bottom layer of the rice. If you don't mind eggs, add Boiled Egg Halves on top on the top layer of rice, before keeping it in the oven. You can add some croutons ( fried Bred pieces) also to add more Restaurantish Touch. If you are eggarian, add boiled egg halves on top layer before keeping it oven...! 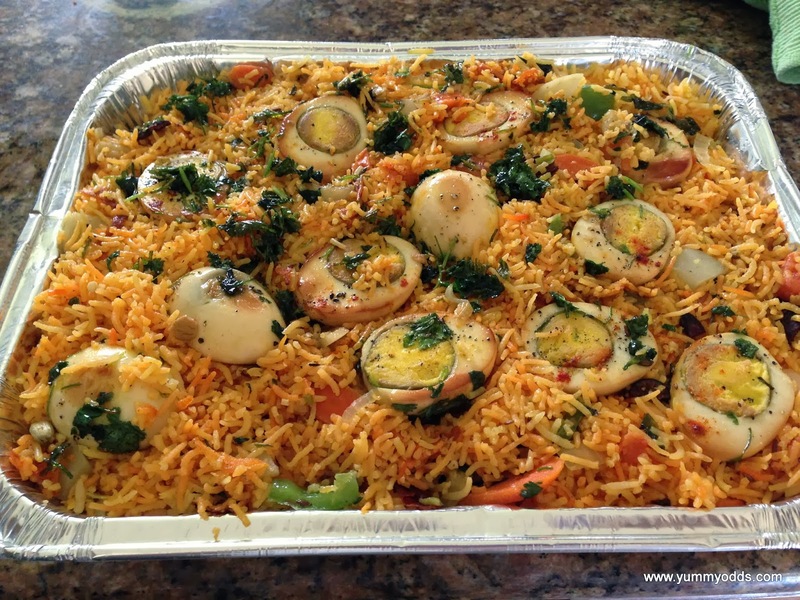 Check Out other mouth watering Biryani Recipes as well! Hope you have enjoyed Today's Recipe with Restaurant Style Touch! will be back later, until then take care! I'm an eggarian and like these rice with eggs... Yum!